Who can deny the appeal of superheroes? The story of humanity is filled with them, real and mythical. Hercules, Genghis Khan, Joan of Arc, Paul Bunyan, Malala…the list goes on. Every culture in the world has them in some form or another, and they all have the same effect on those who hear their stories. They inspire, they encourage, they motivate, they empower. Sometimes they conquer, sometimes they save. Some build mighty empires, some hear the cries of the weak and helpless. Please allow me a moment of shameless promotion. 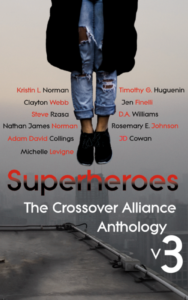 The third short story anthology from The Crossover Alliance had just released, and this year’s theme is superheroes. It’s a great collection of heroic stories that go beyond what you would normally find in a comic book, and I highly recommend it. Now that that’s done, let me segue into the article. I don’t hide the fact that I’m not a big superhero fan. I’ve always considered myself a “casual” fan, much in the same way that I’m a “casual” Trekkie. I know a little about a lot and a lot about a little, but superheroes never really revved my engine. I’ve been a lifelong fan of Batman and I was also into Spider-Man and Iron Man when I was younger, but that was when it was less “cool” than today, and there were far less entertainment avenues through which to indulge one’s superhero appetite. Nowadays the world seems to be in full geek mode, and while some people are totally digging it, it’s a bit of an overload for me. Still, who can deny the appeal of superheroes? The story of humanity is filled with them, real and mythical. Hercules, Genghis Khan, Joan of Arc, Paul Bunyan, Malala…the list goes on. Every culture in the world has them in some form or another, and they all have the same effect on those who hear their stories. They inspire, they encourage, they motivate, they empower. Sometimes they conquer, sometimes they save. Some build mighty empires, some hear the cries of the weak and helpless. The stereotypical modern “comic book” hero usually follows a tried-and-true template: a strong sense of justice, an enemy to fight, a city to save, incredible powers that could easily be used for selfish gain but are instead channeled to combat evil and greed. They are the “good guys,” and while they may sometimes do unsavory things or face moral dilemmas, their hearts and minds are usually in the right place and the people they fight against are always worse than they are. I’ve wondered why audiences and fans so readily accept the often blatant goodness of these heroes, who hardly mirror anyone in real life. With today’s rampant moral relativism and rejection of absolute truth, I suspect that the inna te yearning for truth and goodness in every human heart finds a conduit in these characters. Superheroes often fight against personal trauma and demons but their struggle helps the greater good as well, and they readily take on these challenges, even if it means trouble for them. Fans cheer them on as they fight dastardly villains, then go online and argue about whether black or blue lives matter more or which side of the political spectrum is more idiotic. Things are certainly not always clear-cut in the comic book world but the lines in the sand are a lot easier to see and its not too hard to know who to root for. 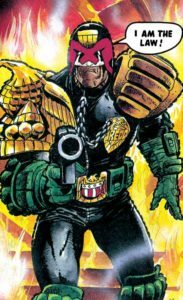 It seems to me that a character like Judge Dredd is the poster boy “hero” for an atheistic, amoral society. His god is the law. Whom and what he is fighting for and against are very clear to him, and he does not run into many moral dilemmas. If someone breaks the law, he hunts them down and punishes them according to that law. He is not “good” or “bad” – he is simply a tool that dispenses what that society considers justice. I think the dictators of the world would be proud. The appeal of superheroes is easy to understand from a Biblical worldview. We know there is evil in the world, we want it removed and balanced with good, we want the bad guys to lose, we want to see selflessness succeed and be rewarded. I think the fact that this so often does not happen in the real world shows the desperation this world has for the goodness that our sin natures have stolen from us. While superhero stories may give us some comfort and excitement, we must recognize that they are merely dim reflections of the ultimate battle of Good verses Evil.